Operational Perspectives on Monetary Policy Implementation: Panel Remarks on "The Future of the Central Bank Balance Sheet"
Good afternoon and thank you for inviting me to join this panel. Last October, the Federal Reserve began the process of reducing the size of its balance sheet—a significant milestone in the ongoing monetary policy normalization process. Using a program of progressively increasing caps, we are gradually reducing the Fed’s securities holdings, which will reduce the supply of reserve balances in the banking system.2 This process will continue until reserves fall to a level that reflects the banking system’s demand for reserve balances and the FOMC’s decisions about how to implement monetary policy “most efficiently and effectively,” as noted in the FOMC’s Policy Normalization Principles and Plans. However, there remains much uncertainty over what the “normal” size of the Fed’s longer-run balance sheet will be and how long it will take to get there. This uncertainty arises from numerous sources: We don’t know how fast our MBS holdings will pay down, how quickly currency outstanding will grow, how many bank reserves will be required for the efficient and effective execution of monetary policy, or how other liability items on the Fed’s balance sheet will evolve. The economic outlook also poses an ever-present source of uncertainty. The projection exercise illustrates a key point: The Fed’s future balance sheet will likely be considerably larger than its pre-crisis level. This outcome is likely regardless of the design of the operating regime that the Committee ultimately uses to manage short-term interest rates. The normalized size will be determined by the liability side of the Fed’s balance sheet, which will reflect two driving factors: Growth in non-reserve liabilities, and a potential shift in the structural demand for reserves. First, there has been substantial growth in the Federal Reserve’s non-reserve liabilities in recent years, and some factors are expected to grow further, as seen in Figure 2. U.S. dollar currency in circulation tends to grow over time and has more than doubled since the start of the global financial crisis, to a current level of $1.6 trillion.6 The median survey response implies an expectation for currency to grow to around $1.8 trillion at the time the size of the portfolio normalizes—in other words, the portfolio will need to be $1 trillion larger than before the crisis just to back currency in circulation. Meanwhile, various account holders—including the Treasury Department, foreign and international official institutions, government-sponsored enterprises (GSEs), and designated financial market utilities (DFMUs)—have increased their balances held in Federal Reserve accounts or investment services, which currently represent over $700 billion in additional liabilities. Second, it is likely there has been a shift in the structural demand for reserves, driven largely by banks’ response to changes in regulations and risk appetite that favor safe assets, particularly reserves. If the demand curve for reserves has indeed shifted out, the amount of reserves the Federal Reserve will need to supply to achieve a given interest rate target will be comparably larger than it once was. The FOMC acknowledged in last June’s addendum to its Policy Normalization Principles and Plans that it anticipates a future level of reserve balances that is “appreciably below that seen in recent years but larger than before the financial crisis.”7 In the three projection scenarios I’ve shown, reserve balances (as derived from market participants’ expectations) are assumed to be around $400 billion, $600 billion, and $750 billion once a normalized balance sheet size is reached, well below the current level of $2 trillion and consistent with the Committee’s statement. However, we have insufficient information to identify what factors inform these views. Taking reserves and non-reserve liabilities together, I see virtually no chance of going back to the pre-crisis balance sheet size of $800 billion. Thus, discussion of whether to have a large or small balance sheet in the long run partly misses the point. The conversation is really about the relative amount of reserves, which will be governed both by the banking system’s demand for reserve balances—something we will learn more about during the process of balance sheet normalization—and by the Committee’s future decisions around how to implement monetary policy most efficiently and effectively. Debates about monetary policy implementation regimes generally center on two frameworks, illustrated in stylized form in Figure 3. The traditional framework—a version of which the Fed used before the crisis—is a corridor system, which is generally associated with a scarce supply of reserves. 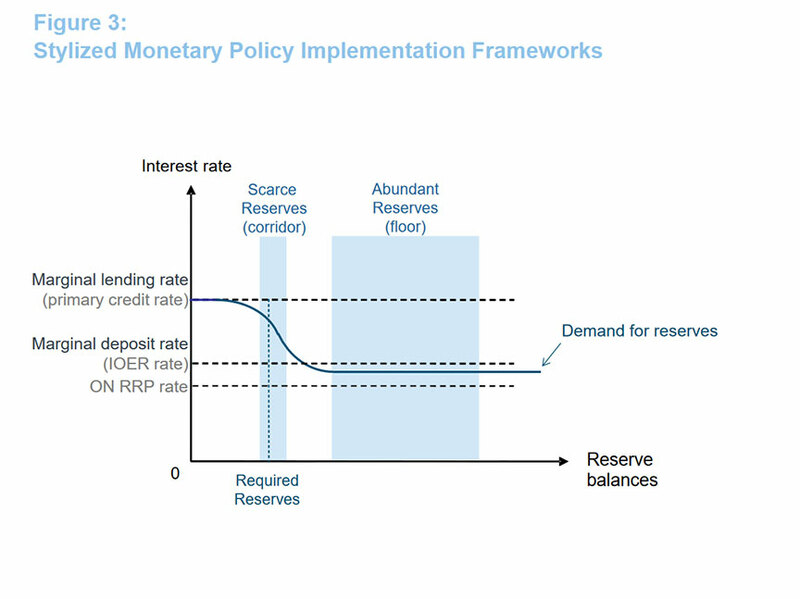 Policy is implemented through frequent adjustments to the supply of reserves, such that the supply intersects the steep portion of the reserve demand curve at the desired overnight interest rate. Fluctuations in reserves stemming from autonomous factors are borne by the private sector through the central bank’s open market operations. In contrast, the framework used to implement policy today is a floor system, which is associated with an abundant supply of reserves and policy implementation that is achieved through periodic changes to administered rates. A floor system is generally associated with a relatively larger balance sheet than a corridor system because the central bank needs to supply enough reserves to satisfy demand on the flat part of the reserve demand curve, perhaps with an additional buffer to accommodate reserve supply shocks. Such shocks typically stem from fluctuations in other liabilities.8 However, we do not really know how large or small a difference in the amount of reserves would be needed to run an effective and efficient floor versus a corridor in the longer run. The answer will depend critically on the shape of the demand curve, which we will learn more about over time, as well as the specific design parameters of either framework. I would emphasize that central banks have successfully implemented both types of frameworks, or variations of them, and that the Fed can achieve interest rate control with either one. Leaving aside some of the broader policy considerations, I’d like to make a few points about the technical operation of each framework in the longer-run. First, some observers see a return to the Fed’s pre-crisis, reserve-scarce corridor system as the natural conclusion to the normalization process, highlighting that system’s familiarity. But it is important to note that fundamental changes in the money market landscape over the past decade would likely make monetary policy implementation in a future corridor system look substantially different than before the crisis. Today, with greater uncertainty and variability in factors affecting the day-to-day demand for and supply of reserves, it would be more difficult to anticipate fluctuations and achieve the necessary balance in reserve conditions even in normal times. In aggregate, reserve demand is likely to be guided by a more complex set of drivers, including post-crisis liquidity regulation, supervision, resolution planning, and intraday payments risk management. These needs have the potential to contribute to higher and more variable demand for reserves than banks had before the crisis.13 Estimating reserve demand would need to take into account these factors, as well as banks’ propensities to substitute between reserves and other relevant assets—something that may vary according to an individual institution’s business strategy. Knowledge about the shape, position, and stability of banks’ reserve demand curve will likely emerge only with experience. Even if fluctuations could be accurately forecast, in a corridor system, they would need to be offset through open market operations to maintain interest rate control. Larger fluctuations would likely require larger operations.15 In the years before the crisis, the average size of daily overnight repo operations was around $5 billion—a relatively small amount given the size of the repo market and dealers’ net securities financing needs. Roughly 95 percent of these operations were for less than $10 billion, and the maximum operation size in normal times was $20 billion. Looking just at recent variability in non-reserve liabilities and assuming overnight operations were used to offset their fluctuations, daily temporary operations in a corridor system might routinely need to be around $25 billion, but could go as high as $100 billion.16 We would need to consider whether the Fed’s repo and reverse repo operations could be dependably scaled to that degree, and whether their effects would be transmitted to other rates. One consideration in this regard is that there appear to be greater frictions across funding markets today. Dealer balance sheets have shrunk and become less elastic in the face of changes in regulation and risk management.17 While dealer caution contributes to the overall safety and soundness of the banking sector, it could mean we would need more or different types of counterparties for traditional repo operations, or perhaps different types of operations altogether—particularly if federal funds trading became idiosyncratic or disconnected from other rates. In sum, a reinstated corridor might look less familiar than some expect. To sum up, the FOMC could choose to retain the floor system to implement policy in the longer-run or it could choose to shift back to a corridor system. However, a reinstated corridor system may be less familiar than some expect. Such a framework would involve uncertainties about reserve demand and greater variability in factors affecting reserve supply, and would likely require operations that are larger, more variable, or even very different from those used before the crisis. Meanwhile, those who favor a floor system may be encouraged by the performance of our current framework to date. We’ve learned that the floor system has proven to be highly effective at controlling the effective federal funds rate and other money market rates, is resilient to significant shifts in market structure, and is efficient to operate. 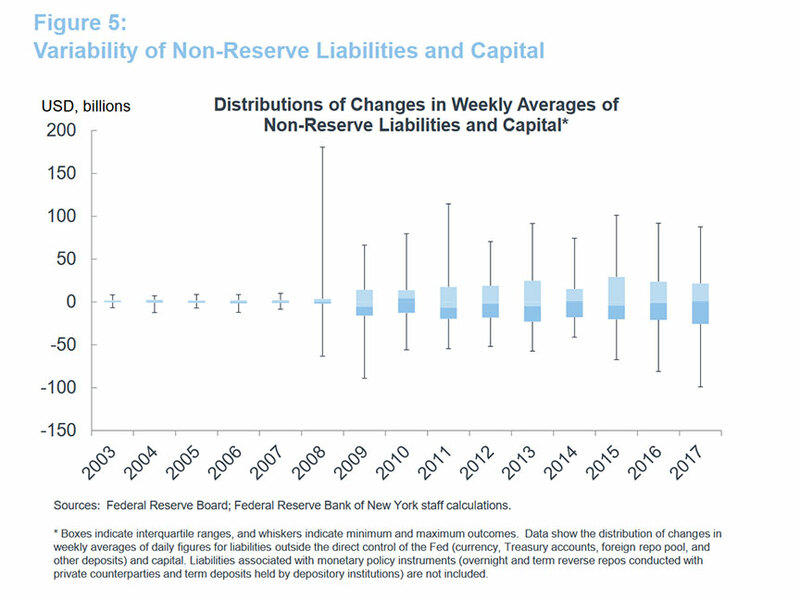 Under either framework, the balance sheet will likely normalize at a level substantially larger than it was before the crisis to accommodate higher demand for reserves and non-reserve liabilities in the post-crisis landscape. 1 I would like to thank Deborah Leonard for her assistance in preparing these remarks, as well as colleagues in the Federal Reserve System, including Antoine Martin, Simon Potter, Julie Remache, and Sam Schulhofer-Wohl, for comments and suggestions. 2 Principal payments from the Federal Reserve’s securities holdings each month are reinvested only to the extent that they exceed gradually rising caps, laid out in a schedule in the June 2017 addendum to the FOMC’s Policy Normalization Principles and Plans. Around the time the caps reach their maximum levels in October 2018, Treasury reinvestments will typically occur only in mid-quarter months, while agency MBS reinvestments are projected to end altogether (assuming no downward shock in longer-term interest rates). 3 See the report and accompanying data file, Open Market Operations during 2017, Federal Reserve Bank of New York. 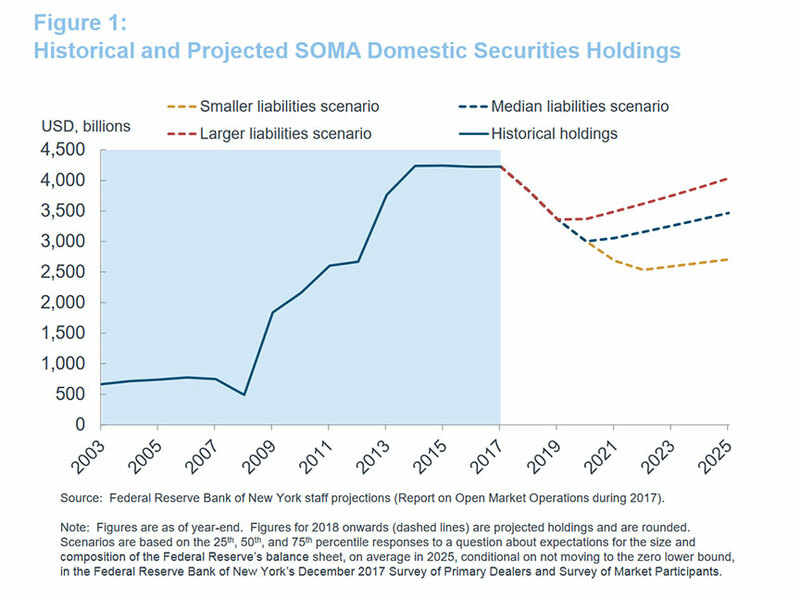 4 The scenarios represent the 25th, 50th, and 75th percentiles of the combined responses to the New York Fed’s December 2017 Survey of Primary Dealers and Survey of Market Participants. The surveys asked respondents to provide their expectations for the composition of the Federal Reserve’s balance sheet, on average in 2025, conditional on not moving to the zero lower bound at any point between now and the end of 2025. 5 Treasury securities would also be purchased to offset the ongoing runoff of the Fed’s holdings of agency debt and mortgage-backed securities. Such rebalancing will support the continuing normalization of the composition of the Fed’s securities portfolio, a process that is expected to take longer than normalization of the portfolio’s size. The FOMC has stated that it intends to hold primarily Treasury securities in the longer run. 6 The December 2017 survey responses used in the three scenarios shown here imply average annual currency growth rates of 2.6 percent, 4.6 percent, and 5.8 percent through 2025—a deceleration from the actual average annual growth rate of roughly 7 percent over the past five years. 7 See the FOMC’s Communications related to Policy Normalization. 8 All else equal, changes in non-reserve liabilities have the opposite effect on the supply of reserves. 9 Reserve averaging over a two-week maintenance period provided a buffer around how precise the final distribution of reserves needed to be on any given day. Nonetheless, falling short of reserves could incur penalties or the need to borrow reserves at what might be relatively high rates, and since reserve balances were not remunerated, there was a steep opportunity cost to holding excess reserves. 10 The degree to which such interbank trading, aimed at fulfilling a requirement imposed by the central bank, reflected fundamentals versus idiosyncratic factors is hard to assess. This ambiguity may obscure the value of its signal on market rates. Simon Potter explores this issue in Discussion of ‘Evaluating Monetary Policy Operational Frameworks’ by Ulrich Bindseil, 2016 Economic Policy Symposium, Designing Resilient Monetary Policy Frameworks for the Future, Jackson Hole, Wyoming, August 25-27, 2016. 11 Challenges operating in this environment are described by the SOMA Manager in FOMC meeting transcripts from September 18, 2007 and throughout the crisis. See also Spence Hilton, Recent Developments in Federal Reserve System Liquidity and Reserve Operations, Reserve Bank of Australia Conference, 2008. 12 A separate operational consequence of the corridor system, revealed during the crisis, is that it can constrain the Fed’s ability to provide the types of lender-of-last-resort backstops that can help support financial stability. Accommodating broad-based, open-ended lending in a corridor system raises the need to drain any reserve additions to keep the federal funds rate close to the FOMC’s target, thus posing a tradeoff between the Fed’s monetary policy and liquidity provision objectives. New York Fed President Bill Dudley recently highlighted this challenge in Important Choices for the Federal Reserve in the Years Ahead, remarks at Lehman College, Bronx, New York, April 18, 2018. 13 Bech and Keister explore the links between open market operations and short-term interest rate changes when banks face the possibility of a Liquidity Coverage Ratio shortfall in Liquidity Regulation and the Implementation of Monetary Policy, BIS Working Paper No. 432, October 2013. 14 Increased variability arises from several changes over the past decade. Since 2008, the Treasury Department has managed its cash flows through the Treasury General Account (TGA) at the Fed; balances in the TGA exhibit significant volatility, typically rising when auctions of Treasury securities settle and on tax receipt dates, and shrinking when large payments are made. (Prior to 2008, the Treasury targeted a steady, low balance in the TGA. It also maintained private accounts, which absorbed the variability in cash flows.) DFMUs have gained access to Reserve Bank accounts since the crisis, and GSEs now pre-position funds in their Fed accounts prior to making principal and interest payments. 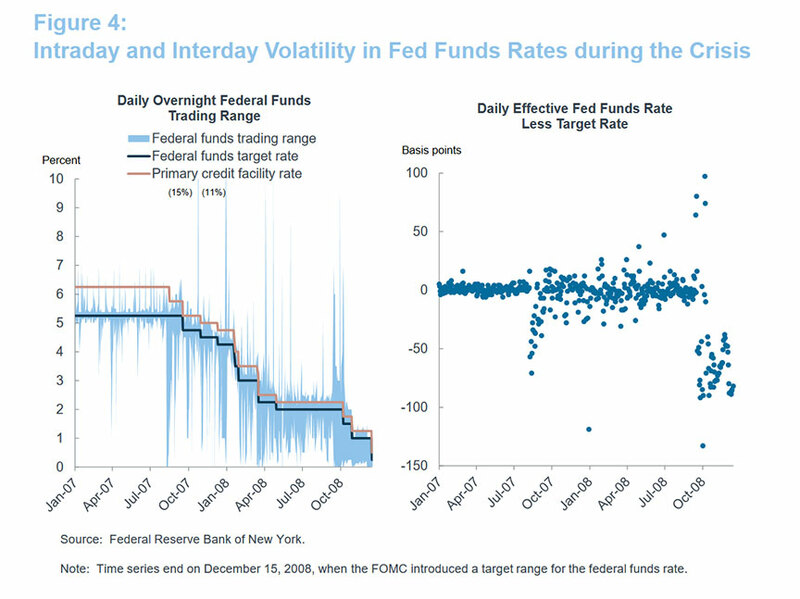 Overnight reverse repos have been introduced as a monetary policy implementation tool. Additionally, in response to foreign central banks’ preferences to maintain robust dollar liquidity buffers and the reduced availability of alternative investments with private counterparties, the New York Fed has applied a less restrictive approach to the management of the foreign repo pool (a long-standing investment service through which foreign official and international account holders’ balances are swept into overnight reverse repos). 15 Changes in other features of the system could potentially help to smooth conditions, for example, certain alterations to the reserves averaging framework might allow the system to absorb more volatility. 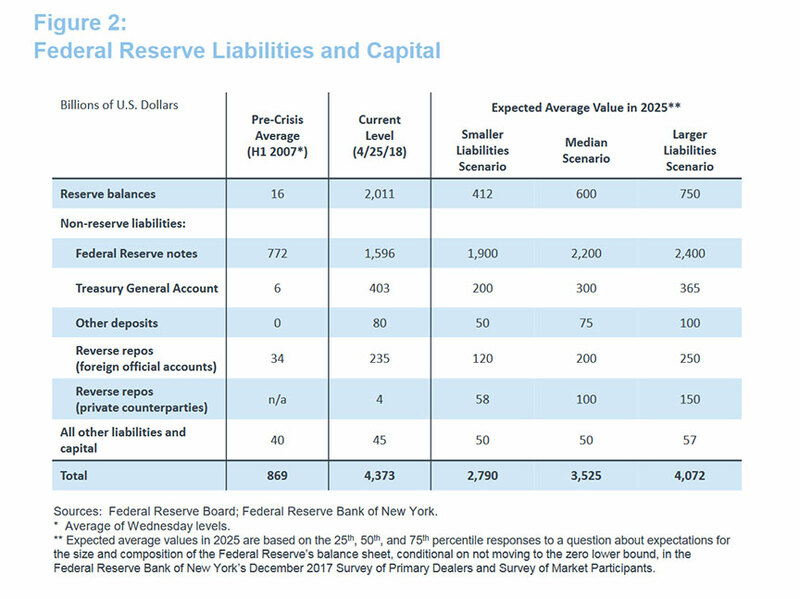 16 These estimates are based on variability of liabilities that are outside the direct control of the Fed (such as currency, the Treasury General Account, the foreign repo pool, and other deposits) and capital. They exclude reserves and liabilities associated with monetary policy instruments (such as overnight and term reverse repos conducted with private counterparties and term deposits held by depository institutions). 17 Committee on the Global Financial System, Structural Changes in Banking after the Crisis, CGFS papers, No. 60, January 2018. 18 The ON RRP facility helps to reinforce the floor under market interest rates by establishing an important investment option for a wide range of active lenders in short-term funding markets, including certain types of nonbank institutions that are not eligible to earn interest on reserves. Take-up in ON RRP operations is sensitive to the pricing of the Fed’s reverse repos relative to the pricing and availability of comparable money market investments, including private repo, Treasury bills, and agency debt. Even with near-zero usage, as has been seen in recent months, the ON RRP facility supports market rates by ensuring that counterparties demand rates on other investments at least as attractive as the rate offered on the Federal Reserve’s ON RRPs. 19 In a preliminary discussion about the long-run monetary policy implementation framework, FOMC participants commented on the advantages of an approach to policy implementation similar to the one currently in use, in which the active management of reserves would not be required. Such an approach was seen as “likely to be relatively simple and efficient to administer, relatively straightforward to communicate, and effective in enabling interest rate control across a wide range of circumstances.” However, policymakers made no decisions and acknowledged that they expected to learn from additional experience. See Minutes of the Federal Open Market Committee, November 1-2, 2016. 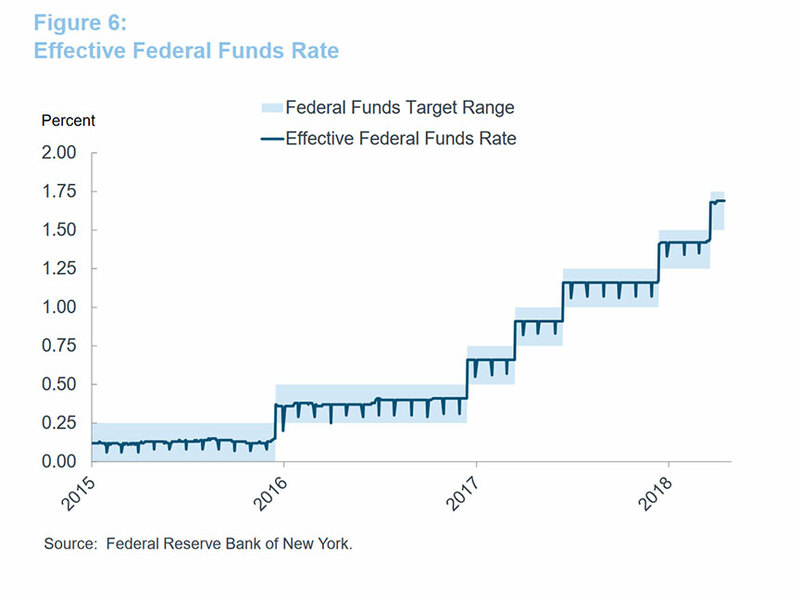 20 We should also recognize that the fed funds rate might occasionally firm somewhat due to increases in interest rates in other money markets, which can affect the fed funds rate via arbitrage. Such developments are not necessarily a sign that reserves are becoming scarce. It is therefore important to understand dynamics not only in the fed funds market, but also across a broader range of money market instruments and transmission across them. Simon Potter features some such analysis in Money Markets at a Crossroads: Policy Implementation at a Time of Structural Change, remarks at the Master of Applied Economics’ Distinguished Speaker Series, University of California, Los Angeles, April 5, 2017. 21 I discuss these issues in more detail in Implementing Monetary Policy: Perspective from the Open Market Trading Desk, remarks before the Money Marketeers of New York University, New York City, May 18, 2017.